Manuka Me Better is committed to being your go-to Manuka honey resource. We keep you up to date with the latest news and scientific research on Manuka honey's unique therapeutic benefits and review Manuka products. 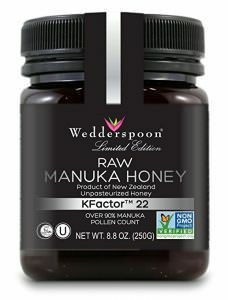 Wedderspoon is an incredibly popular manuka honey brand. If you look on Amazon, you’ll see that people love it and it has a ton of positive reviews, but I do not recommend it. In this Wedderspoon manuka honey review I’ll go over the pros and cons of Wedderspoon’s manuka honey and why I think there are better options if you’re looking for high quality manuka honey. Manuka honey has been getting a lot of positive attention recently in the news and on social media for its unique healing properties. It gets used as a natural remedy for a variety of ailments from soothing sore throats and boosting immunity to treating acne and healing wounds. Manuka honey really does have some amazing qualities. What these news reports and social media posts often fail to emphasize is that not all manuka honey has exceptional healing qualities. Only high grade manuka honey has potent antibacterial properties. This is an important point to remember and we’ll dig into how this relates to Wedderspoon’s manuka honey a little later in this review. If you’re looking for a manuka honey with exceptional healing qualities and just want the punchline: The short answer is that you may want to look elsewhere. Check out our list of the best manuka honeys from other brands. Wedderspoon’s manuka honey hasn’t been heated above a temperature of 118F. This helps to preserve the naturally occurring enzymes and antioxidants in the honey. The antioxidants and enzymes nautrally found in honey can help prevent cellular damage from free radicals and aid digestion. When honey is heated to high temperatures it denatures the antioxidants and enzymes, effectively removing their benefit. Another benefit of raw honey is that it preserves the naturally occurring hydrogen peroxide in honey, which also breaks down at high temperatures. Honey with higher levels of hydrogen peroxide have stronger antibacterial qualities. The hydrogen peroxide in honey is somewhat unstable and tends to break down over time. In general, though, raw honey has higher levels of hydrogen peroxide. If your product contains honey, we require documentation showing that the 4-mile radius surrounding the beehives is free from all high-risk commercial agriculture and that any supplemental feed is compliant with our standard. Despite these issues, this standard does a good job. It helps ensure that the honey is mostly non GMO, which is great if you’re trying to limit you intake of GMO products. 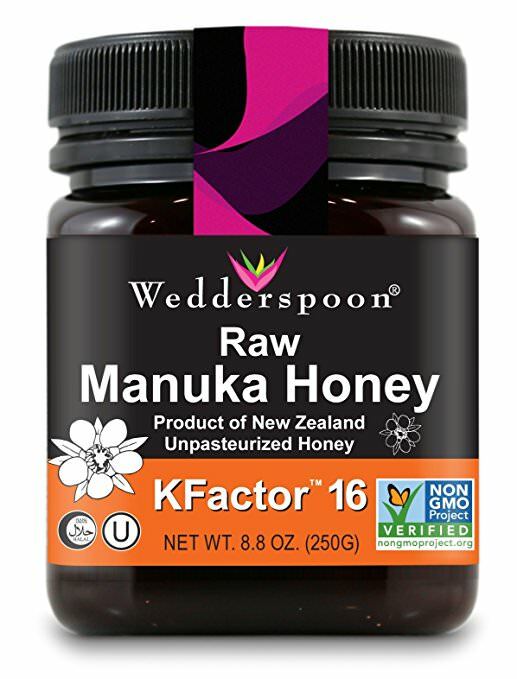 Wedderspoon manuka honey is generally cheaper than other manuka honeys but only if you ignore the antibacterial potency of the honey. This can make it appealing if you’re just looking for manuka honey and not super interested in its antibacterial strength. Realistically, though, the reason most people look for manuka honey is exactly because it can have high levels of antibacterial activity. With that list of features, it may be hard to understand why we don’t recommend Wedderspoon manuka honey. I only have one gripe with Wedderspoon’s manuka honey but I think it should be a deal-breaker if you’re looking for high quality manuka honey. Remember when I said not all manuka honey has exceptional healing qualities? We’re finally getting back around to that. The reason manuka honey is so highly prized is because it has non-peroxide activity (NPA). But not all manuka honey has NPA. Manuka’s NPA is much more stable than the hydrogen peroxide that can be found in any honey and is much more effective at fighting off bacteria. In the world of manuka honey, purity does not equal quality. Quality manuka honey is manuka honey that has high levels of NPA. With the KFactor grading system, you have no insight into the NPA of Wedderspoon’s manuka honey. Because Wedderspoon doesn’t offer any indication of the NPA in their manuka honey, I recommend looking elsewhere if you’re after high quality manuka honey. If the antibacterial activity of your manuka honey isn’t your biggest priority, by all means pick up a jar of Wedderspoon’s manuka honey. The fact that their honey is raw and non GMO means it’s a high quality honey by normal honey standards, just not compared to other manuka honeys. Just make sure you get their lower grade KFactor 12 manuka honey. There’s no real benefit to paying extra for their higher grade honeys. Copyright text 2019 by Manuka Me Better.